Was born 1979 in Kiev, Ukraine. 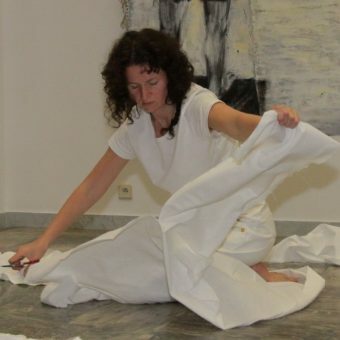 Education: Moscow State University of Culture and Arts, photography; School of Performance at the Days of Performance Art in Lviv (Ukraine, 2015) under the guidance of Sandra Johnston. Awards: Photographer of the year, Ukraine (2014, 2013). Member of many photo exhibitions, photographs are published in Ukrainian and European journals. Performances: Enough, Moscow (2015); Take off me (GOGOLFEST, Kyiv. 2015); Belowground, Kharkiv (2015). Lives and works in Kyiv.